Dena Stevens, mother of Sean and Ian Stevens, drops the ceremonial first puck during Alpena's Purple game against TC West. 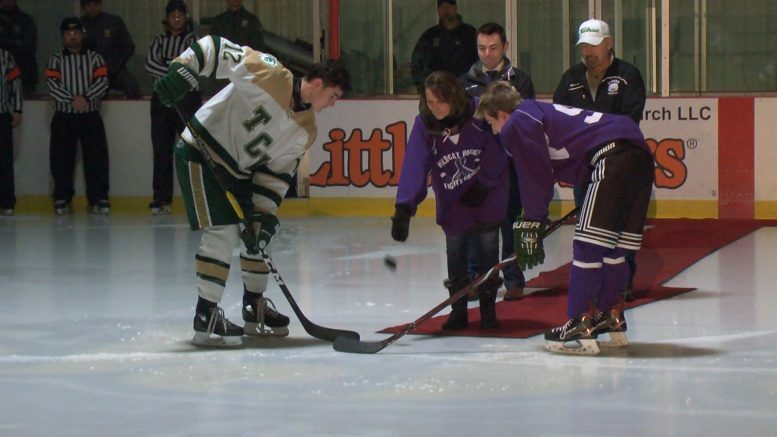 Alpena, Mich — The Wildcats and Traverse City West Trojans combined for Alpena’s annual Purple Game, which benefits Friends Together of Alpena. Friends Together provides support, care, guidance, and so much more for those who are battling cancer. There was a brief ceremony before the game where survivors were recognized and signs were shown in support of those fighting the disease. Dena Stevens, a cancer survivor, dropped the ceremonial first puck. Both of her sons, Ian and Sean, are involved with Alpena’s hockey team. Ian is an assistant coach, and Sean is a junior on the team. Christian Boivin represented the Trojans during the puck drop. The Boivin family has also been affected by cancer and the crowd showed its support for him and everyone else who had been affected. The Wildcats took a 2-0 lead from two Colby Plowman goals in the first period. Kyle VanDusen assisted on both. Alpena ran into trouble in the second period as TC West managed to tie the game. Tyler Easman set a perfect screen that allowed Caleb Barshef to score from the point on a power play. Plowman responded with his third goal of the game seven seconds after the equalizer. Brett Cuipka scored in the third, and Plowman added his fourth of the game as the Wildcats won 5-2 in an emotional game for many in attendance. The win brings Alpena to 16-4-1 and moves them to the top spot in the Big North Conference (5-1, 10 points) ahead of Petoskey. The Wildcats are at home throughout the week. They’ll resume their postponed game against Gaylord on Tuesday (Alpena leads 3-1 with 8:30 to go in the second period), and continue their home stand with games on Friday and Saturday. Saturday’s game against TC Central is Alpena’s final home hockey game of the season.